As happens to most us, our doorbell rings from time to time, and we open the door to a smiling face of a child, young man or young women, on the fundraising circuit. They are hawking candy, popcorn, magazines or coupons to local eateries in the name of a club, a cause, a scholarship or a school program. So it has been these last four years when the young man across the street rings our doorbell each fall and spring. In the fall he sold coupon packages to help support the Bozeman High School cross country team. In the spring, the sales supported track and field team. Our neighbor is a runner. His name, appropriately enough, is Chase -- Chase Equall. In addition to the 3 mile and 5K cross country races, he runs 800, 1600 and 3200 meter races for the Bozeman High School track team. When Chase stopped by last fall I asked straight up, "What kind of times do you run?" He mentioned a 3 mile time with a 15-minute handle. "Wow, that's motoring!" I said. I started paying attention. During the school year I am up early and into town taking one of my daughters to "0" period class at the high school, and/or headed to the Swim Center (attached to the high school) for my early morning laps. Last fall and winter I saw Chase most every morning running through town at 7:00 am whatever the conditions, rain, sleet or snow. Chase Equall wins the Bozeman Invitational. 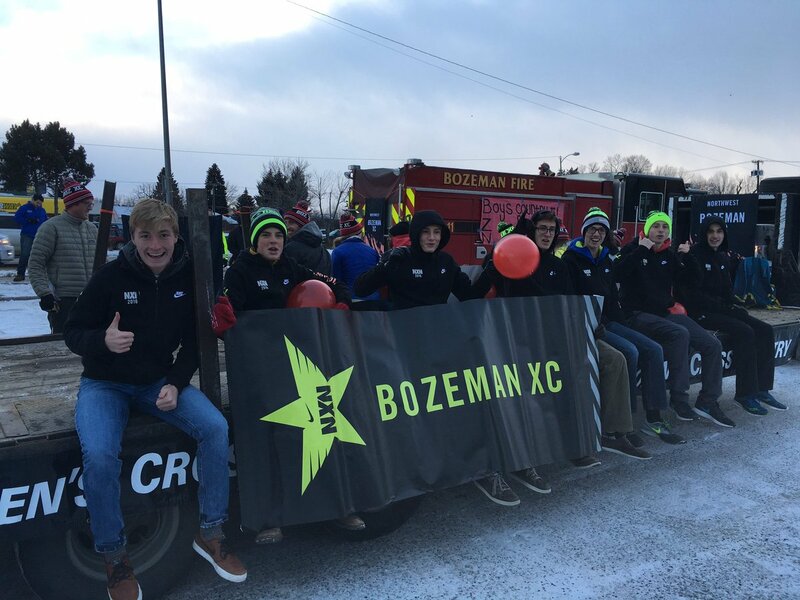 The 2015 Bozeman High School Hawks boys cross country team won its eighth straight state title. Chase competed as the number two runner on that team and finished fourth in state individually. Last spring Chase finished second in state at 1,600 meters. During the spring season Chase began beating his teammate and long-time cross country rival Riley Collins. Chase showed steady and strong improvement, besting his sophomore year record of 4:31 and freshman year record of 4:45. Chase's 4:13 1600 meter time at the state meet is the equivalent of a 4:15 mile, quite a feat for a high school junior. When Chase rang the door bell this September I said "Hey, don't underestimate yourself. Shoot for the moon!" He is doing exactly that. He has left teammate Riley Collins, and virtually every other runner in the Pacific Northwest, in his wake. This last September, Chase beat the field in a 50 school race, which included competitors from Washington, Idaho and Montana. For Equall, the win was the culmination of a steady climb since the seventh grade. "I always wondered what it would be like to win it," said the Bozeman senior, who was 11th last year. "It’s awesome, I’ve seen it so many times, so many iterations. To be on top my last time here, I couldn’t ask for more than that." Equall and Beatty were neck-and-neck for much of the race. "It went out more conservatively than I thought it would," said Equall, who won with a time of 14:58.95. "It was just (Beatty) and a few guys, then a pack behind him, which actually I was very pleased with because I wanted to start out more moderately and then accelerate, which I did. "There was a pack of guys all gunning for Marshall and I decided to go with them at about a mile-and-a-half and I think it paid off pretty well." Amir Ado of Spokane Ferris finished second in 15:01.47, followed by Ben Perrin of Kalispell Flathead in 15:18.90. Beatty finished fourth at 15:21.65.Equall was happy the runners were only required to traverse the hill once, as opposed to twice in last year's race. "I was very glad," he said. "It’s a variable that’s hard to contend with." Equall's win helped the Hawks to the team title with a score of 62. Lewis and Clark was second at 123 and Ferris was third at 177. Montana Sports named Chase athlete of the week in mid October. 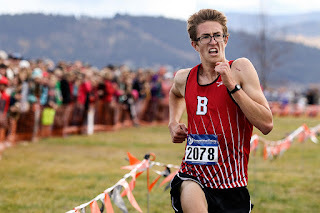 Bozeman – Cross Country runners take off as a group, and usually stay together for awhile, but by the time they get close to the finish, this year anyway, Bozeman senior, Chase Equall, has been all alone. However, he never considers himself lonely. 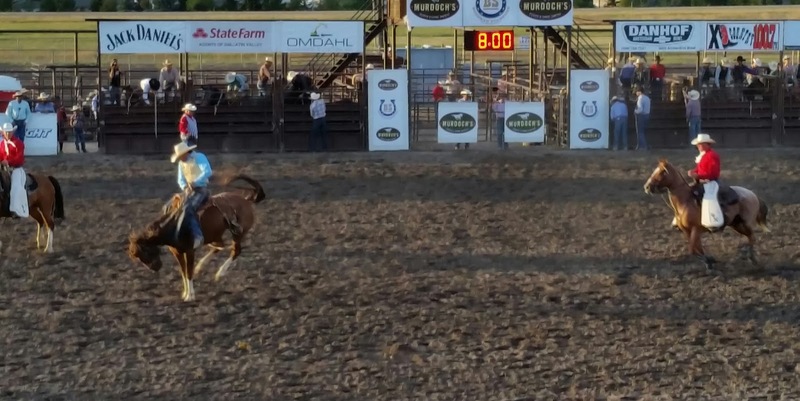 Equall (his name is pronounced Eck-wul) has been sensational this year, with a 14:55 clocking in the three mile at the seven on seven meet in Helena, and one of the best times in history at the Sunfair in Yakima. But it all starts with his grueling workouts. Chase also loves his studies. He has a perfect 4.0 grade point average and for all of that, we are awarding him a beautiful plaque from Bozeman trophy, as our Outstanding Athlete of the week. He just got home from a recruiting trip to the University of Washington, and he’s also being recruited by Montana, Southern Utah and Georgetown. “Chase will go to the next level,” promises his coach. “He will run in college, and will run well, will compete really well. and will be a good athlete. In late October Chase led the Hawks to their ninth straight state title. No. 2 runner Orrin Clark didn’t compete because of a knee injury, and No. 4 Dylan Humberger had an asthma attack. Head coach Casey Jermyn didn’t hide his excitement for what he believes his team can accomplish when at full strength at the Nike Cross Regional Northwest meet Nov. 12. Chase Equall surges to the lead in the state meet at Kalispell. Bozeman’s dominance shocked no one, but Equall’s 14:40 placed him among the state’s all-time best. He said he was aware of the all-class record of 14:37 set by former Montana State and Eureka great Shannon Butler in 1985, but not the AA mark. Jermyn said Friday that he didn’t expect many personal bests because of long, thick grass at Rebecca Farms. The first-year coach said a concrete roller flattened the route and helped produce fast times.Equall executed his strategy perfectly, Jermyn said. His pupil ran a steady first mile, took over in the second and then cruised. “I knew he had that in him,” Jermyn said. Two weeks later the Hawks surged to the regional title in Boise, led by Chase's second place finish. If there was pressure, the Hawks had it under control.They were the focus throughout fall — the online rankings that labeled Bozeman’s cross-country teams tops in the northwest. Hawks head coach Casey Jermyn did his best to shield his runners from outside expectations, but all were aware of their status. There was comfort, however, in racing again Saturday afternoon at the Nike Cross Northwest Regional in Boise, Idaho. Last season, the girls won a second title there and the boys took second. These runners knew what needed to be done, Jermyn said, and didn’t disappoint. Bozeman delivered its most declarative statement yet. The Hawks claimed both regional titles for the first time and will head to the national meet in three weeks to continue adding to program history. 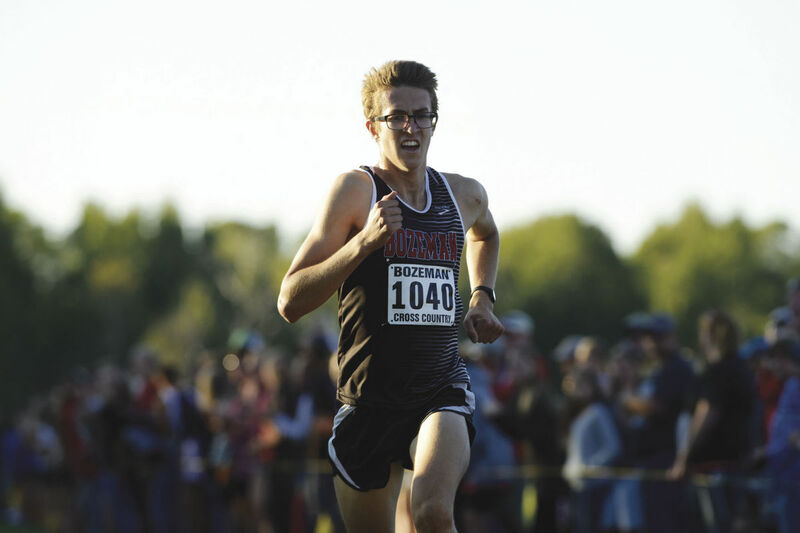 What’s happened is first-year coach Jermyn listened to his runners’ desires to win more than state titles. While in previous years Bozeman’s focus has been on being the best in Class AA, this fall goals were affixed to qualifying for and competing in Dec. 3’s national meet in Portland, Oregon. That’s why the Hawks are only scratching the surface in terms of how fast they can go. There’s no better example than senior Chase Equall, who went from being a top 20 runner in the region to one of its best. Things didn’t go according to plan from the outset of the 5-kilometer race, though, and he was slowed at the start. It was then a dual between him and Tacoma, Washington’s James Mwaura. Mwaura edged Equall by five seconds in 15 minutes, 13.2 seconds. Junior Duncan Hamilton (15:40.1) wasn’t far behind in sixth. Followed by a parade up Main Street. Way to go Hawks. Way to go Chase! It's here, it's now and it's real. After a mostly fair and unseasonably warm November, to the delight of local snowshoe trekkers, cross country and alpine skiers, ice climbers and snowmobile enthusiasts, winter has descended onto us hard and fast in the weeks following Thanksgiving. The local ski area, Bridger Bowl, opened to excited crowds Friday. The skiing is delightful, as attested to by the opening day video. (since Nov 1) 47" 47"
Intrepid extreme skiers are hiking to The Ridge (search beacon transponders and shovels required) from where they can shoot down rocky chutes and tree-lined seams. Webcam screenshot capture on the Ridge above Bridger Bowl, elevation 8,500 feet, December 11, 2016. As the snow piles up, avalanche dangers also advance. The Gallitan National Forest Avalanche Center has issued it's first set of warnings, blanketing close to 5,000 square miles. Yesterday we had our first serious avalanche incident of the season. Yesterday in the Northern Madison Range, a snowmobiler was caught and fully buried in an avalanche in the second Yellowmule on Buck Ridge. He was located with an avalanche beacon by his partners and was uncovered with minimal injuries for a fortunate outcome. This event highlights the importance of being prepared with the right gear and the right partners. The avalanche likely broke on a layer of weak sugary snow above an ice crust on the ground (photo) and was on a heavily wind loaded slope. Snowfall totals since Thursday equal 1” of snow water equivalent (SWE) throughout our advisory area with over 1.5” of SWE in the southern ranges. Strong winds yesterday transported new snow into fresh drifts near ridgelines and increased the stress on buried weak layers (video). Wind slabs and new snow slabs may rest over weak snow that formed on the surface during last week’s cold temperatures, and could be easy to trigger today. Avoid steep terrain if you see fresh wind slabs or cracking and collapsing in the new snow. 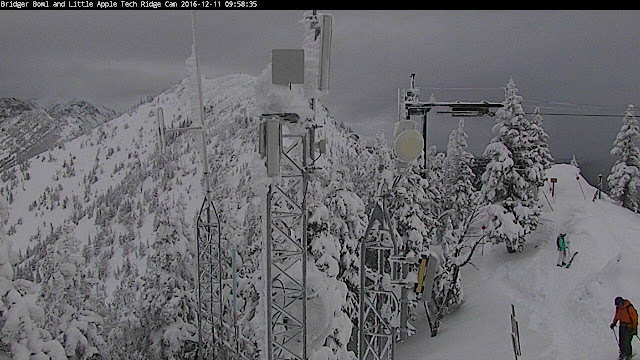 New snow and wind-loading also added weight to a layer of weak facets near the ground (video, video, video). Ski patrols triggered avalanches on this layer over the last week (photo, photo); and avalanches failed on this layer in the backcountry, including the one that caught and buried a snowmobiler yesterday on Buck Ridge. Wind loaded slopes will be the most likely place to trigger an avalanche on this layer, but avalanches are also possible on this layer on non-wind loaded slopes. Choose terrain with lower consequences and dig a hole to look for this layer before committing to steep terrain. 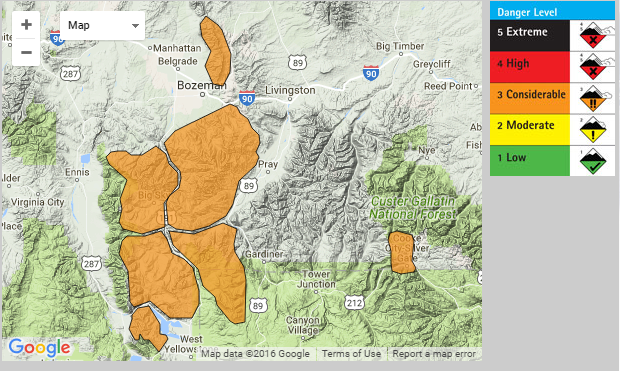 Recent snow and strong winds create unstable conditions today and the avalanche danger is rated CONSIDERABLE. Here is the Avalanche Center's December 10 video documenting forces that lead to avalanche. In this blog we have documented again, and again, and again, and again the deadly impacts of avalanche. Please have fun and be careful out there. A skier was killed in an avalanche on Henderson Mountain outside Cooke City today. We will have more information the the coming days. Some more details reported today. Officials have identified the skier who died Sunday afternoon in an avalanche north of Cooke City. Christopher Peterson, 55, of Ketchum, Idaho, was killed after being buried in an avalanche on the north slope of Henderson Mountain. The avalanche was reported to be 6 feet deep and 100 feet wide, according to the Gallatin National Forest Avalanche Center. Peterson, who was skiing with six others, was completely buried and located at the base of a tree with a transceiver by members of his party, the Avalanche Center said in a statement posted to Facebook. They dug Peterson up within 15 to 20 minutes, but could not resuscitate him with CPR. When rescuers arrived, they took over and tried an AED to revive Peterson, but he was pronounced dead. Another skier was partially buried but wasn’t hurt. Here is Avalanche Center video from the scene with the complete story. Yesterday, Eric and I investigated the avalanche that killed a skier on Henderson Mountain outside Cooke City. The skier was in a party of 5 and his descent was the 7th track on the slope when it avalanched. He was carried into the trees and buried under 5’ of snow. Another person was buried to his waist, uninjured, as he stood in the runout zone. The victim was found with avalanche transceivers and dug up in 15-20 minutes. CPR was initiated, but unsuccessful as trauma was a likely factor in his death. The slope was only 250 vertical feet, but steep, averaging 40 degrees. The crown was 3’ deep and the path was 150’ wide. The avalanche broke on a layer of weak, sugary facets sitting on an ice crust 1’ above the ground. Our deepest sympathy goes out to his family and friends and his Ketchum, Idaho community. Throughout the nation, high schools, colleges and universities host homecoming celebrations this time of year. So it was Saturday in Bozeman, Montana, with the Montana State University Bobcats, blue and gold, hosting the University of North Dakota Hawks on the gridiron. Yesterday morning the homecoming parade snake down Main Street. We were in attendance to support the locals and watch our flutist perform. Main Street was bordered with Montana State flags and banners on the lampposts throughout downtown. We set up across from Ted's Montana Grill. 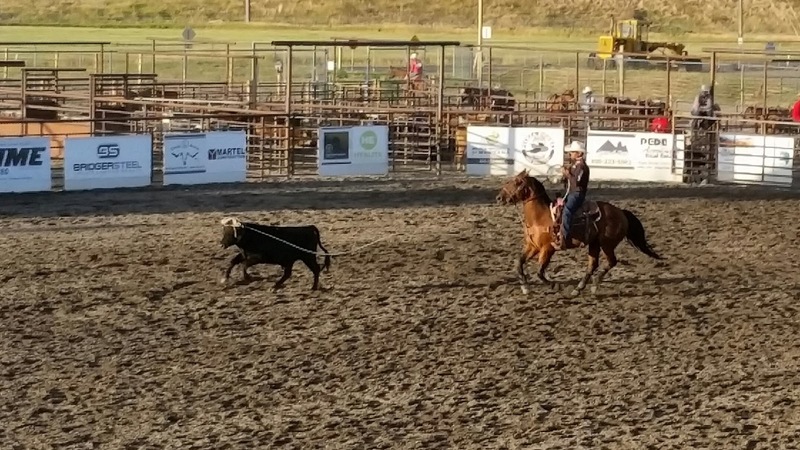 This is about as close to the food source as you can get, for Ted Turner's Flying D ranch, where the buffalo roam, is down the road to Big Sky. We are Montana, so, of course, there was a horse troop..
Then horses hauling the Murdoch's Ranch and Home Supply covered wagon. Followed by a pooper scooper to pick up offerings left behind by equine friends. It’s been fifteen years. Our daughter Blake was a baby, only ten months old. Teresa was pregnant with Blythe. Bella was not born for four more years. My kids ask questions, trying to understand – wondering about the underlying causes and what it was like to live through that day. When we still lived in Arlington we visited the Pentagon Memorial. 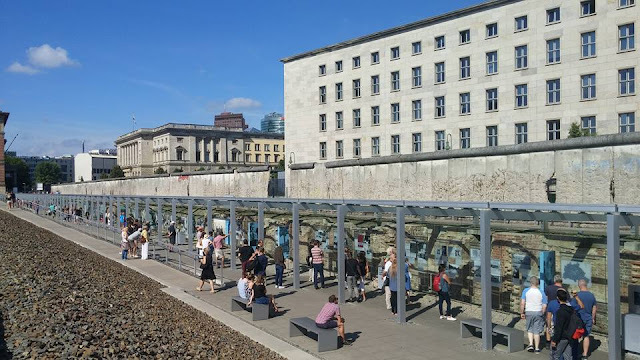 It is a solemn and surprisingly solitary place despite being hemmed in by major thoroughfares and lying adjacent to a structure, which gauged by size of its footprint, is the world's largest office building. This is my story, one among millions -- a personal recollection of that day's experience, or more specifically that morning, in Washington, DC and Arlington, Virginia (where the Pentagon is located). I worked in an office building at L'Enfant Plaza in Washington, DC, across the Potomac River about a mile and a half northeast of the Pentagon. We lived in Arlington Virginia, between Arlington Boulevard and Columbia Pike, about a mile and one-half west of the Pentagon. 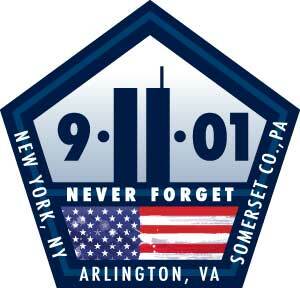 Our world as we knew it was shattered that day, but the tragedy was inflicted on others -- innocents to a person. We haven't blogged much this year at Along The Gradyent for a number of reasons, not the least of which is focus on family and health. On the health front I am proud to say I dropped 60 pounds since the first of the year. To get there we changed our diet and ramped up our exercise program. I look forward to continued weight loss. I intend to keep up the new regimen -- now a set of habits -- for a very long time, let's say the rest of my life. I increased the distance of weekday swims from around 1400 yards with multiple breaks, to 1500 to 1600 meters continuous. This entails more work increase than the longer distance alone suggests, because of less frequent push offs from 50 meter lengths (compared to 20 yard widths). Although Michael Phelps and Katie Ledecky have nothing to fear, I've picked up the pace by a good 25 percent as well. Unlike previous years, in 2016 I kept swimming throughout the spring and summer after the golf season opened. To ease the doubling up in the beginning I rode a golf cart. But as of late I've been swimming in the mornings and walking all 18 holes on the links. At times there is even a little spring in my step, especially a couple of weeks ago when I celebrated my first hole in one, on the par 3, 146-yard 14th hole at Cottonwood Hills. 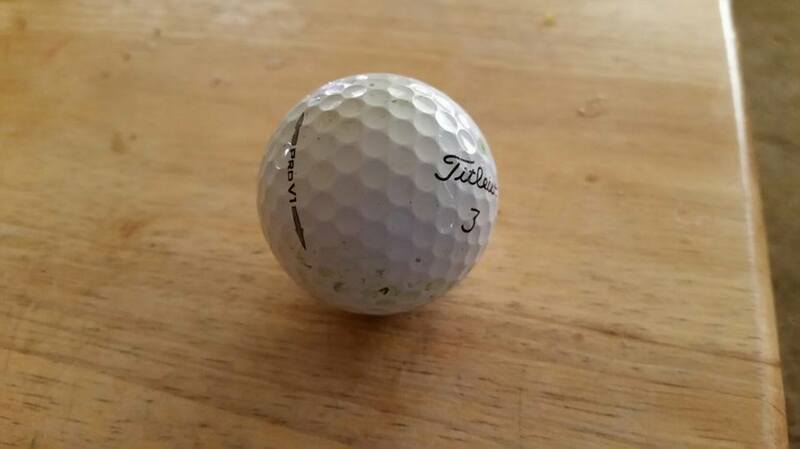 Hole in one ball -- a cut seven iron uphill on the uphill 146 yard (measured on a rangefinder that day) par 3 14th hole at Cottonwood Hills Golf Club in Bozeman, Montana. The tee was all the way back and the pin was on a little ridge in the front section of the green. We saw the ball hit the front edge, hop once and then roll along the left to right slope and melt into the cup. I completely eliminated sugary drinks from my diet. This is an enormous change, as I had been a dedicated fan and prodigious drinker of Coca Cola virtually from birth. I reduced food portions mostly from 30 to 50 percent and have enjoyed our fresh home garden harvest this year (carrots, beets, potatoes, onions, radish, broccoli, peppers, cucumbers and tomatoes included). Previous German language study is not a requirement and all levels of language ability are encouraged to apply. Only those students who meet the basic eligibility requirements will be considered. Applicants from all racial, economic, ethnic, religious, and social backgrounds are encouraged to apply, as are students with disabilities. 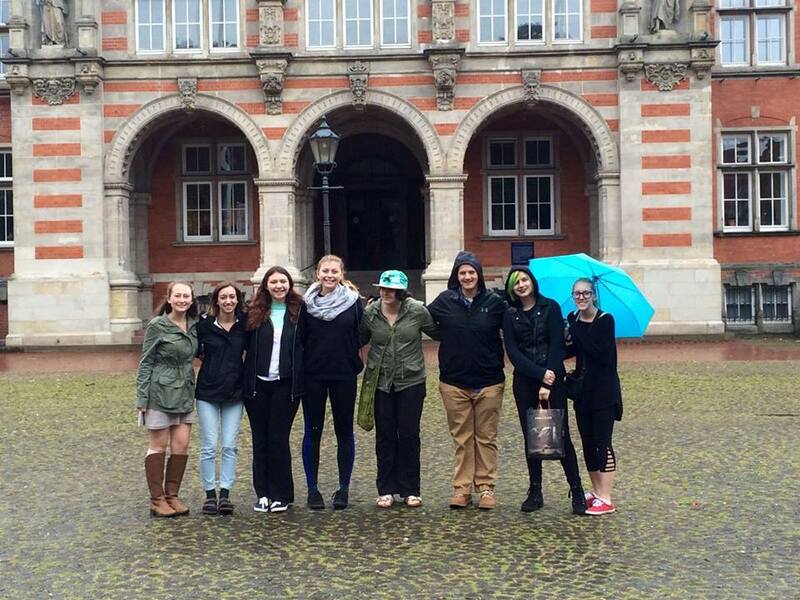 After a few early August days touring in our nation's capital with her fellow CBYX scholars, they flew to Frankfurt and hopped on a train to Hamburg where the scholars bonded during the course of a three week intensive language camp. CBYX scholars in front of old city hall, Hamburg, Germany. Blake has been with her permanent host family for just over a week now in the hamlet of Plau am See (6,055 population) where she will spend her junior year of high school attending the Gynasium at Malchow (just across the "See"). The first full weekend in town she has already posted pictures from a visit to Berlin (50 miles distant). Berlin Wall, September 2, 2016. 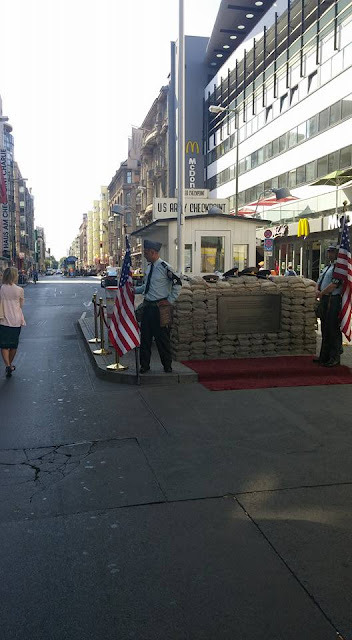 Checkpoint Charlie, September 2, 2016. Blake was Gold Award Winner in the Level 3 National German Test (90 or above percentile) last spring. Our family hosted Lisa, a German foreign exchange student for the 2014-15 academic year, who has let it be known she hopes Blake will "visit her favorite foreign exchange student" auf Deutschland. Our middle daughter is blossoming beyond belief. She traveled to Japan this summer with her aunt where she put to full use her startling command over the Japanese language achieved courtesy of YouTube. 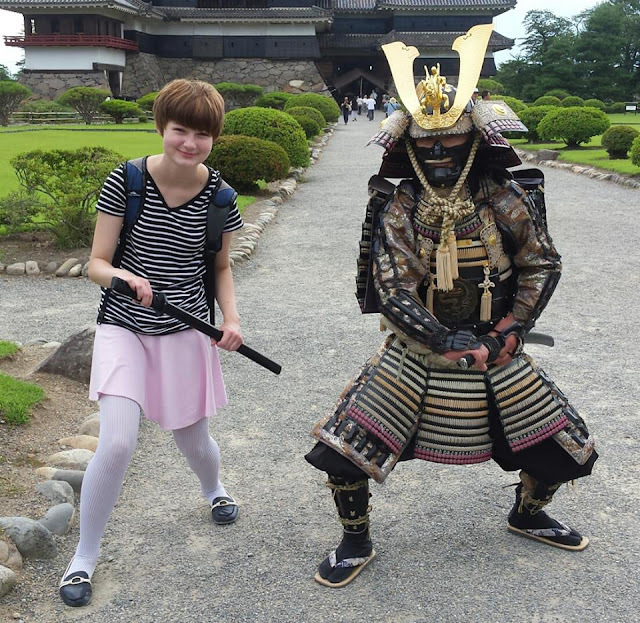 Posing with Samuri, at Matsumoto Castle, Nagamo Prefecture, Matsumoto, Japan. Among a wide variety of experiences they visited, Asa, the Japanese foreign exchange student who we hosted uncer the aegis of the 4H program in the summer of 2014,. You wouldn't think there a whole lot of opportunity for international culture exchange here in Montana, eh? Blythe started high school last week, where she hit the ground running almost literally as a happy and involved member of the Bozeman High School Hawks marching band. Our youngest child, age 10, is the strange kid, the odd kid, the out of sync kid, a kid who is totally nonstandard in this world of data driven top down standards based education. Which means she was a problem kid last year as far as her teacher and newly minted gung ho common core principal were concerned (previously she had fantastic teachers). She got picked on, demeaned and bullied (including assaults) by classmates and labelled a liar by her principal. We learned the hard way those anti-bullying signs they have every 50 feet in the hallways in the public schools are just that -- signs. We had to pull her out of school last spring and now are focusing on undoing the damage and hoping to get her committed to our home school program. In a fit of anger, she destroyed my computer (and much of my blogging research) in the aftermath. We got her a cat from the shelter a few weeks ago -- HER cat. There are signs of hope. No matter how many tries and how much time are required, we are going to make this work. Only one bull rider made it the full eight seconds. Perhaps the best competition of the night was the Bull Scramble, involving audience participation. 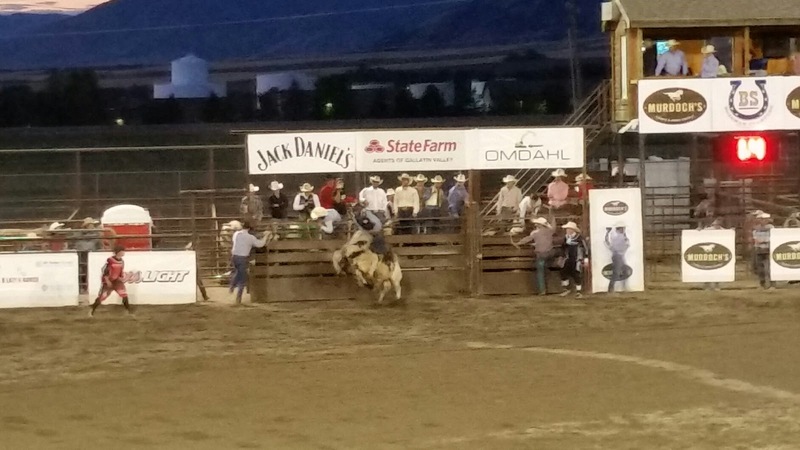 What is a Bull Scramble you might ask? Watch and watch to the end. My buddy Buzz says the rodeo requires scramblers to sign a waiver certifying they don't have an IQ over 70. You may have noticed the last man standing (who had already won by virtue of being the last remaining in the circle) did not respond to the yelled instruction to get out of the circle before the bull threw him into the air. As for the future I intend to continue research and writing. I have a couple of Morton Grove history posts in mind, and have a bunch of ideas for new genealogy posts. Some will be on parts of relatives lives I have not previously written on (like my grandfather Ike's auctioneer career), others will be on relatives not previously featured, and yet others will supplement posts previously written (for example, the on-line digitization of the Los Angeles Times published in August makes newly available dozens of references on my uncle Lyn R. ("Red") Foster). I have a new Glen View Club post or two to get on to after I reconstruct research, and I intend to focus some on Bozeman, after getting acquainted with the resources available at the Gallitan County Historical Society and the Bozeman Library. I write this post on Labor Day, September 5, 2016, because we have an early taste of late fall/early winter. Temperatures are in the 40s. It is rainy. When the clouds clear from the mountains I suspect we will see snow. Until later. Bozeman American Legion Post 14 sponsored the Memorial Day parade down Main Street today honoring those who gave the ultimate sacrifice in defense of family, neighbor, life and liberty. Here we share memories of the day. Boy Scouts from Belgrade passed out American flags to spectators up and down the route to wave in recognition of the participants and to honor of those who gave their lives. The stars of the parade were veterans who served in wars and campaigns from World War II, to the Korean War, to Viet Nam, to Desert Storm and Desert Shield, to the Iraqi and Afghanistan operations, and others. The marines were well formed and well drilled. We welcomed and applauded Viet Nam veterans. Crow Nation National Honor Guard and veterans proudly marched. American Legion Post 14 ferried some of the less mobile veterans in a well appointed jitney. Honoring World War II ace and Medal of Honor recipient Joe Foss though scholarships and fellowship. What would a Memorial Parade be without a procession of red, white and blue Mini Coopers? We had our own mini version of Rolling Thunder. With a bit different backdrop from Washington, D. C.
Military marching music provided by the Bozeman "Hawks" High School marching band. Accompaniment on the bass drum by a certain green haired young lady who we are proud to say is recipient of the Congress Bundestag Youth Exchange scholarship, and will attend the Gymnasium next school year in Plau Am See, Germany. Blake, make sure to say hi to Angela for us. If you get in a heap of trouble down at Big Sky, in Bear Canyon, Yellowstone National Park or anywhere else nearby, chances are the rescue will be via the Gallitan County Search and Rescue, a volunteer operation coordinated by the Sheriff's department. Every winter they rescue (or sadly recover) skiers, hikers and snow mobile enthusiasts marooned or caught in avalanches in the back country. Here is a horse drill team, appropriately dressed in US Cavalry regalia, seeing as Fort Ellis, just east of Town, was a historic military outpost providing security for Bozeman from 1867 to 1886. Fort Ellis all volunteer FD is my local department. If you roll over along I-90 east of town headed up to Bozeman Pass likely it will be Fort Ellis EMTs and firefighters that extract the victims, provide first aid and ensure safe transport Bozeman Deaconess hospital. Come visit you hear. And stop and shop at Murdoch's on North 7th Avenue so you can dress up everything West and Montana. Make Mommy, Daddy, Gramps and Grammy Oh So Proud! I had things I wanted to say and became tired of trying to force fit views by commenting on other people's blogs, so I started this enterprise. Contact me at gradyfosterone@gmail.com Your comments are welcome. If they are relevant, and when negative, stick to sticking it to only to public figures and don't defame or invade anyone's privacy. I'll publish them. Extended stories about life and family history are especially fun to write. We have the great fortune to have had many relatives who had prominent civic, professional, and/or political lives, which yields many thousands of references memorialized in press clippings and otherwise. I have received plenty of help from relatives who choose to remain unnamed. Those stories garner high readership. They are tagged with "Bathgate." I would say my politics are libertarian leaning. I seldom vote for Democrats, and usually don't vote for Republicans -- I have been known to get writer's cramp in the voting booth. Please do read and enjoy. Will Amazon Be Good For Arlington?